"I can't stress enough... that my full focus is on leading my country to France 2016," Coleman said. "Hopefully we finish well and I'm leading the team to France and then I imagine that would suggest that we'll be sitting down sooner or later to talk about the future. "It's been the biggest honour of my career to lead my country." Wales' unbeaten Euro 2016 qualifying campaign has catapulted them into 10th place in the Fifa world rankings, which saw them in the pot of top seeds for Saturday's 2018 World Cup qualifying draw. Coleman's side were drawn in Group D alongside Austria, Serbia, Republic of Ireland, Moldova and Georgia. 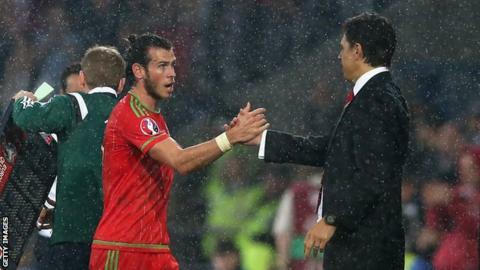 But before that campaign starts, Coleman's task is to guide Wales to Euro 2016 and reach their first major finals since 1958. "At the moment I've had great backing from the FAW [Football Association of Wales]; my staff have been magnificent; there's nothing more I could ask from the Welsh public, they've been brilliant," Coleman said. "That has to continue to get us over the line. With four games left, two wins would seal our fate. "But like we've always done, all that counts is the next game, this next 90 minutes away to Cyprus [on 3 September]. "We've never found it easy in Cyprus, we've had some poor results out there and some poor performances. "So it's a huge game, it's a massive test and that's all I'm concentrating on." "I'm sure we'll be speaking with Chris, hopefully well before the European Championship finals," Ford said. "But one step at a time, let's get to the Euro finals first. "He's doing a good job and we've got a fantastic record at this moment in time, and we're delighted where we are in the qualifying group. "We wouldn't want to cloud the European Championship finals with discussions over contracts and we'd be planning on doing something like that well in advance. "But I'm sure we'll have a beer at some point and have a chat about it." Ford admitted that clubs would have a renewed interest in employing Coleman, whose previous jobs include managing Fulham, Real Sociedad, Coventry City and Larissa. But the FAW chief has no doubt over Coleman's loyalty: "Chris is passionate about Wales, he is Welsh of course that always does help, and it's not just a job it's a calling. "That's what it is for the players, that's what it is for all of us."